Sometimes during a press sessions at the SIHH you get a sense of a ripple of interest, a vibe if you like, coalescing around something. Perhaps it’s more acutely felt when you feel drawn to the same thing yourself, but in any event the first press presentation on Monday was with Jaeger-LeCoultre, and the watches were these, new additions to the Master Control collection. Although they were not a focus of the actual presentation itself, the three new Master Control models are some of our top picks for the SIHH of 2017. We did not expect them and, speaking as someone who has been a bit hit and miss about Master Controls, I found myself coming back to them (one in particular) repeatedly as the days passed. 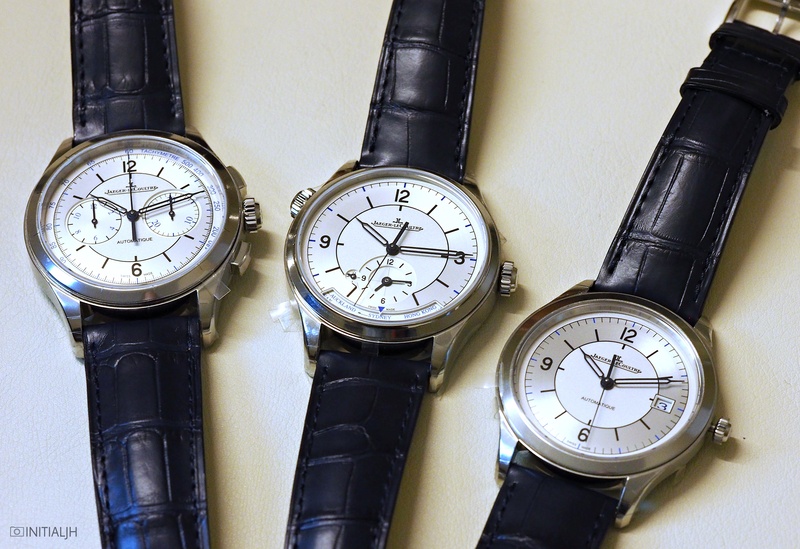 Welcome to the Master Control Date, Master Control Chronograph, and the Master Geographic. It’s not always about having something exciting or groundbreaking. For the most part, perhaps for most people, it’s about watches that are good looking and well executed, and these, a special collection released to celebrate 25 years of the Master Control line, are that, although with their two-toned sector dial and blue accents are design codes hearken to more vintage times. First up is the Master Control Date, which 39mm of stainless steel case with a thickness of just 8.5mm. Inside is the Jaeger-LeCoultre Calibre 899/1 with a gold winding rotor and thirty-eight hours of power reserve. However, as I mentioned, it’s all about the dial with these new watches. The Master Control Date has a two-tone sector dial with a brushed silver outer track and a grained inner area, both separated by a darker sector. You will see, however, that the sector markers at each quarter hour go inwards. The hands, skeletonised and reminiscent of vintage watches which would have these filled with luminous material, are kept open. This is a handsome watch which probably could only have been improved by losing the date altogether. This second new watch is my favourite of the three – the Master Chronograph. The case is 40mm and 12mm thick, and does sit bigger than the Master Date on the wrist. It is, however, still in the sizing sweet spot range where the size will appeal to a broad range of wrists. Inside is the automatic Calibre 751G with a sixty-five power reserve, but it is not visible, unlike the other two pieces in this new collection. What is the most appealing about this one? Well it’s the dial. With the sector dial, dual register that aren’t too close, typeface, balance, it just works. The third of the triumvirate is a new version of the Master Control Geographic, a watch that has had some previous incarnations. This one looks completely new (old) but yet still ‘very Jaeger-LeCoultre’. Inside is the Calibre the 39mm case (thickness of 11.8mm) is the Calibre 939B/1, which allows for the second time indicator and city disk revealed via a dial cutout at the bottom. These rate amongst those watches that stood out the most for me at SIHH 2017. They are well-sized (something that should never be underestimated), simple clean and balanced designs, manage a nod to vintage pieces without being an homage or reissue, and tick the dial design boxes. As mentioned, these are a special collection (limited production but in number) and I believe they will be only available for twelve months, so if you are interested, you know how long you’ve got. The Australian RRP for the Master Control Date is $8,300.